Whipped cream in a can: an Isigny Sainte-Mère invention! In 1969, our cooperative invented a previously unheard-of product: whipped cream under pressure in an aerosol can. It is made in a traditional way, with attention to detail, such as the addition of natural vanilla from Madagascar. Every season we are proud to provide a product that brings together fruit, ice creams, sorbets and other sweet treats with such style and ease. Every day this light and fluffy dairy product helps amateur pastry cooks to add a crowning glory to their Pavlovas, Black Forest gateaux and countless cupcakes. Unbeatable whipped cream in a can ! 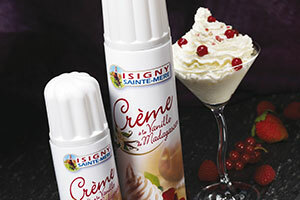 Isigny Sainte-Mère is the only dairy processor to flavour its canned whipped cream with natural vanilla of Madagascar. The result is a meeting between of the normandy terroir and an exotic taste. The product is unique, bringing together a famous cream and natural vanilla from Madasgascar. The result is appreciated by consumers, who recognise its unique qualities. Isigny Ste-Mère in the conquest of the relieved! All the pleasure of the whipped cream with only 20% of fat. 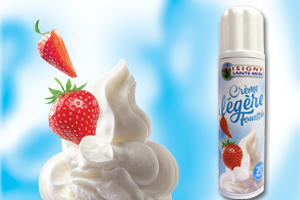 A perfect combination of flavours : the light whipped cream with a subtle touch of natural vanilla of Madagascar.